16,000 meals a day. 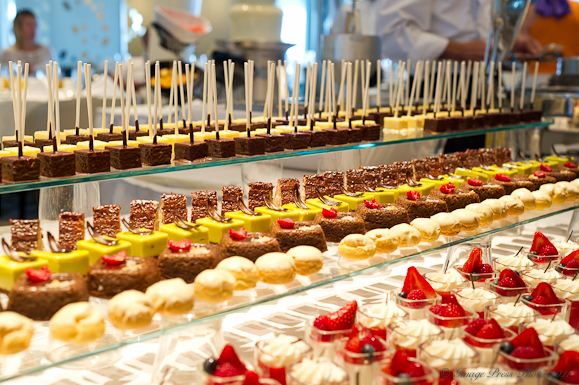 That is how many meals are served on board the ship, Celebrity Eclipse, to 2800 guests and the ship’s crew each day. Can you imagine the menu planning and the grocery list that it takes to serve that many meals? We have seen the grocery list and it is staggering. For an average 16 day cruise, the Eclipse will go through 25,545 pounds of beef, 10,252 pounds of chicken, 22,652 pounds of fish, 15,200 eggs, 96,540 liters of milk, 58,659 pounds of fresh vegetables, 52,652 pounds of fresh fruit, 250 pounds of herbs/spices, 35,000 liters of beer and 18,450 bottles of wine, just to name a few items. The complete list was quite impressive. Even more impressive is that for the most part, these provisions are delivered in one shipment while in port during the turnaround before setting sail again. If you think being an Executive Chef of a restaurant is a stressful job, how would you like to be responsible for serving over 16,000 covers a day, eight months out of the year and manage 186 employees? 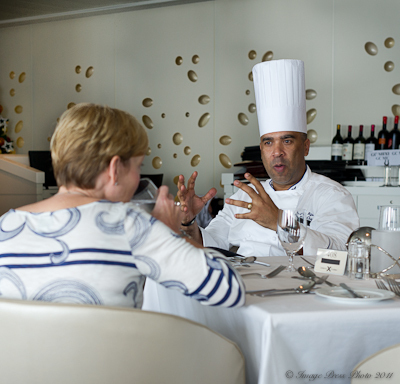 That is exactly the job required of Executive Chef German Rijo on board the Celebrity Eclipse. Chef Rijo took time out of his incredibly busy schedule to chat with us while we traveled on the Eclipse during their Savor Your Destination culinary cruise several weeks ago. 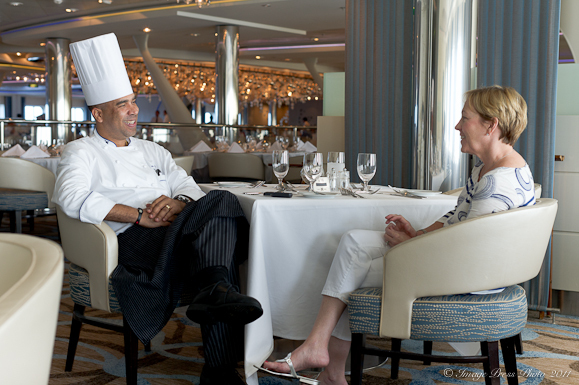 Chef Rio has been with Celebrity Cruises for 20 years and has been Executive Chef for 15 of those years. His culinary education began in his home country, the Domican Republic, learning as a young boy in the kitchen with his mother. He then moved to Miami, going on to England and France for more training. He has opened five new ships including the Eclipse, Equinox, Millenium, Summit and Infinity. Residing in the Dominican Republic with his wife and two children when not at sea, Chef Rijo has a great personality, smiles effervescently and enjoys a good laugh. While he is getting calls every few minutes during our conversation, he seemed incredibly relaxed for a man with what has to be a true 24/7 job. He attributes his ability to relax (just a bit) to his very strong team on board the ship. This team is comprised of 174 cooks and 12 assistants which include three Executive Sous Chefs and five Sous Chefs. He said that Celebrity Cruises is excellent when it comes to training their staff so they thoroughly understand the menus and proper service which makes his life less complicated. The Solstice Class ships, which have been named as “Best Cruise Ships” by Frommer’s 2011, are outfitted and provisioned the same to promote consistency of experience for the guests as well as facilitating easier transfer of staff between ships. 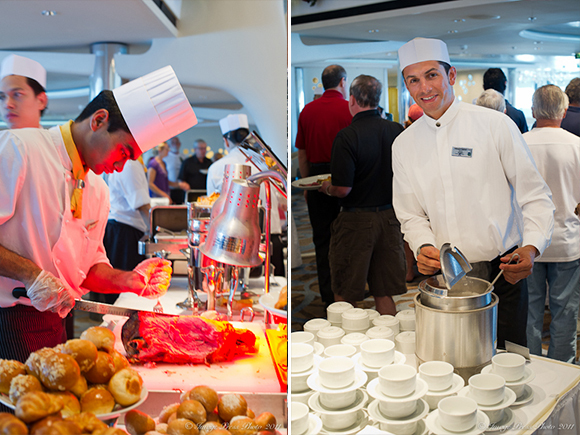 The ships have the same restaurants and menus, including specialty restaurants. Guests come to expect the same cruising and dining experience on board one ship as they would have on another. The ice sculptures and stations were beautiful, complete with champagne! Since each restaurant on board the ship has its own galley, there are three Executive Sous Chefs that are responsible for the Ocean View Café (casual indoor and outdoor dining), all of the Specialty restaurants on Deck 5 and the main dining room, Moonlight Sonata. There are Sous Chefs that manage the galleys of each of the Specialty restaurants: Murano, Qsine, Tuscan Grill, Blu and Bistro on Five. In addition, there are several other dining venues including the AquaSpa Café (for AquaSpa class passengers), Mast Grill and Café al Bacio & Gelateria. 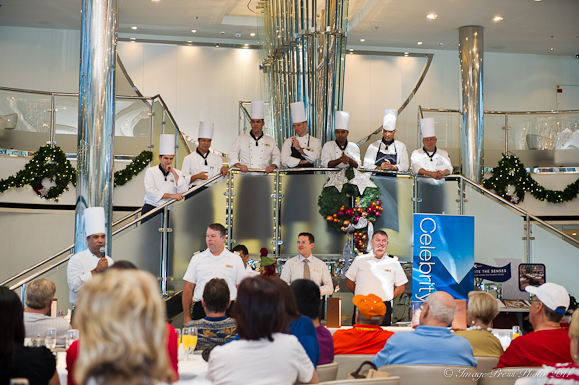 James Beard Award nominated Executive Chef Jacques Van Staden creates all the menus for the Celebrity ships. 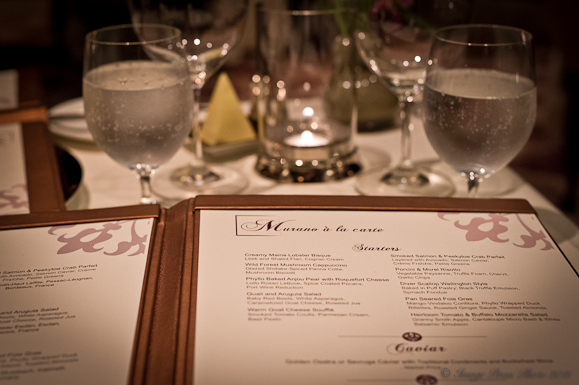 Chef Rijo and his team are responsible for executing these menus on board the Eclipse. Thank you. It was a delightful trip and Chef Rijo was a real pleasure to meet. He has quite the job! My dear woman! What a production it takes to prepare all that food! I’ve always been curious to learn more about the people behind the scenes on cruises, and it seems like Chef Rijo is an amazing leader for his crew. Thank you for sharing with me…I feel tired tonight after baking three cakes…I can’t imagine how he does it! The galleys are truly impressive on a ship this size. I don’t know how they do it day after day, but they seem to have it all figured out to a science. Chef Rijo has a great sense of humor, so I am sure that is how he brings everyone together to handle the job. He was a lot of fun to meet. Wow! This really gives you an idea of the size and scale for which staff on a ship must prepare. This is an eye opener – it’s hard to imagine doing that every day of the year! I agree. We fuss about preparing dinner every night and then you look at these chefs who cook at this magnitude…who can complain now?! It was definitely interesting to see the galleys, the prep and how organized it all is. Wow! I just want to do a backstroke in their dessert “aisle” or would that be “isle”????? Giggles Happy New Year Gwen! What a great write-up Gwen! Informative and great supporting images. 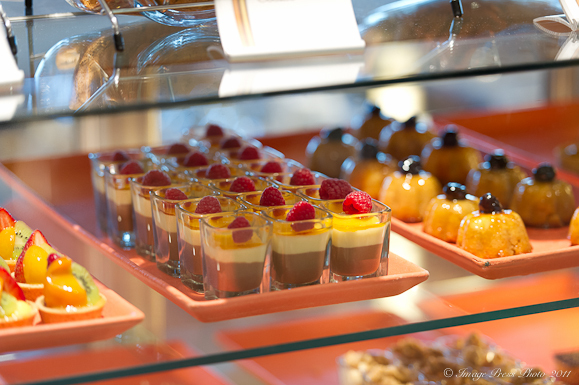 I’ve enjoyed two cruises and I don’t think I gave it a second thought about all the planning that goes into the fantastic food that some cruises serve (that was before the TC blog). Love that menu board – very impressive. I am sure most people don’t really think about what goes on behind the scenes and how much work and staff is involved in putting out all of the meals each and every day while on board the ship. The fact that they do it all so well is a real testament to Chef Rijo and his team. We were very impressed. We hope to see you this year, too! It’s been too long. Thank you for your comment. 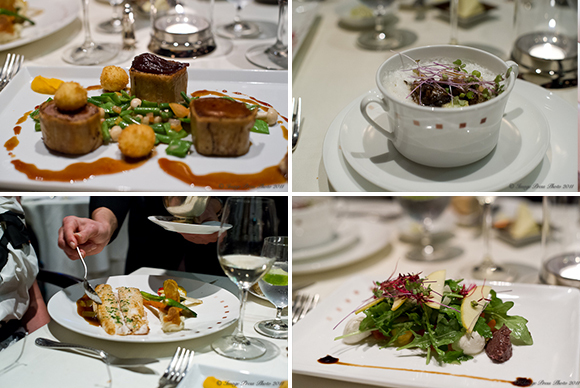 The work the chefs do on board is truly spectacular. 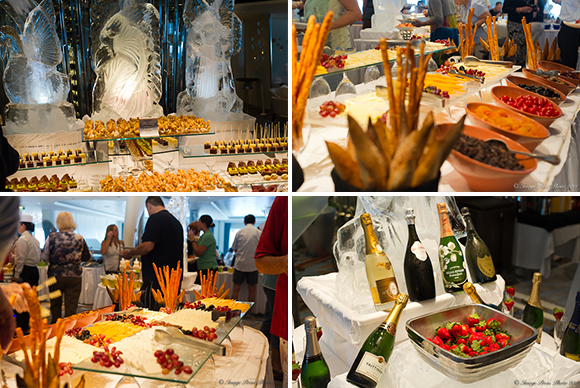 The buffets that were prepared during our cruise were really beautiful and the meals we had excellent. Celebrity has a very nice culinary program and Chef Rijo does a particularly impressive job with his team. I had no idea the prep and production that went into each day.. great interview. Wow 16,000..
Would like to tell that I had a pleasure to meet this extraordinary man and work with him. So proud of his job and so happy about him. and would you be so kind to tell me at wich ship he works now,?.I would be very thankfull. Thank you for your comment. I do not know which ship Rijo is on now. It is also possible that he returned home after so many years of travel. If you contact Celebrity, they may be able to tell you. Thank you for leaving a comment. I am glad that you enjoyed reading the article. I know Chef Rijo will be pleased to see your comments as well. 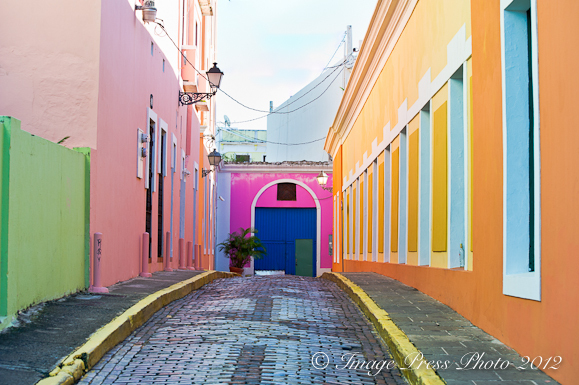 I worked with Chef German Rijo for several years………. Thank you for your comments, Vijay. The job Chef Rijo does on board the Eclipse is impressive and I am sure he is a great inspiration to many who work with him on the ships. thank you so much for information :). I’ll try to contact him through the Eclipse. mail. chef german rijo,:great personality and outstanding leader,mentor…..no word to use in my vocabulary. hope one-day he will show up and tell me: malik (my nick name) treat me with your creation….i am waiting for that moment to arrive…this would be greatest moment of my professional career. stay blessed chef.